Digital marketing is still an evolving segment and therefore the interview may be unstructured. Interview questions for a digital marketer will depend on job profile. But, whatever the profile, you are assessed on 3 levels- personality, language & communication skills and professional skills. The content of the interview also depends upon if you have applied for an entry level job, a limited experience or if you are an expert. In an entry level job, you will assessed on your attitude and education background. Your personality will pay a big role. The prominent question is why do you want this job? If you have some experience, your role as a team player or team lead will come into question as well as your skills. At the expert level, you need to balance the right attitude with your skills to crack an interview. You will be judged on your knowledge, experience and leadership skills. Make a list of all the sticky situations you have been in and how you resolved it. There is no need to get intimidated. Each interview starts with a job application. You, the applicant can assess the suitability of the job against your knowledge base, skills and value compatibility. Research the company well. Check out their website, social media channels, particularly LinkedIn and blogs. Check out their missions and vision statements. If it’s a large corporate company, do a bit of academic reading of its history, name of the founders and its last 4 CEOs. But, what’s more important is that you know the functional details of its standing today. What is the company doing today? What is its share in the market? What are its growth plans? And where do you fit in the overall structure? For instance, in an interview, the interviewer asked the job applicant, applying for the role of manager, if he knew what the share of their company in the Indian eCommerce pie is. Make notes where their mission or vision matches a principle in your life and where you can actually give an example to the interviewer panel, if required. For instance, if the company mission is to educate each marketer in the nuances of digital marketing and you share the same vision, you should mention it. If you have nothing, no worries, you can always try and guide the interview to your skills. Another aspect of researching the company is that you understand the work environment. Is the work environment casual or formal? This will help you develop an attitude and body language. This will also help you decide on the very worrisome question: what to wear? Most digital marketing agencies work in a very casual environment and there is a lot of bonhomie amongst the colleagues. So, if you are transitioning from a very casual to formal, you need to take care. 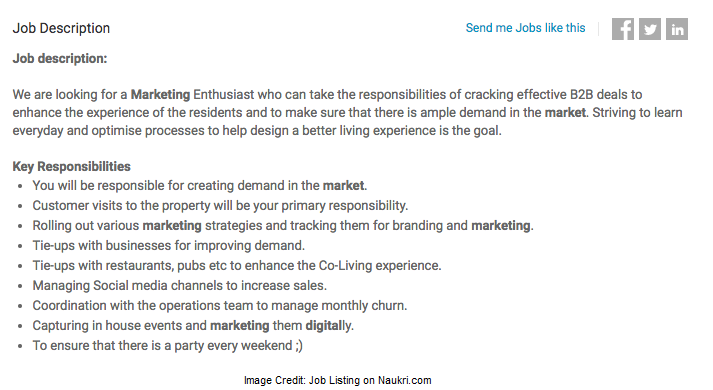 Read the job listing in detail. Underline each keyword in the listing and prepare a list of probable questions from those keywords. Prepare answers to those questions. If necessary read up, practice interviewing and brush up those rusty skills as that will make you appear more confident. Remember while you may have the best skills, your company is looking to hire the best possible candidate in terms of all-round personality too. While the top profile is looking for a serious digital marketer, it is apparent that the marketer will operate in a silo structure and budget may be a bit restricted but the work is clearly cut out. Note the usage of KPIs and ROIs in the job description. This means you will be expected to give a road-map and achieve targets and your performance will be monitored on those. It’s a very structured job. You can plan questions around them to assess the company’s expectation of the campaign. Have you ever independently handled a digital marketing campaign? What was it about? What digital marketing strategies have you used in the past? Which digital marketing channel are you most familiar with? Are you aware of any tools to measure ROI from social media? Describe a campaign which was extraordinarily successful. How will you test your landing pages? What kind of campaign budgets have you worked on? What elements did you use in your sales funnel? What tools have you used? From the profile description and the stress on tracking and reporting, this section should be very well prepared. Even if you have not used the tools, you should be aware of the features in analytics and reporting tools. It’s very acceptable to ask questions to clarify what they are talking about or ask for a bit of information that will help you decide on a suitable response. The job profile displayed below is very different from the job profile above. 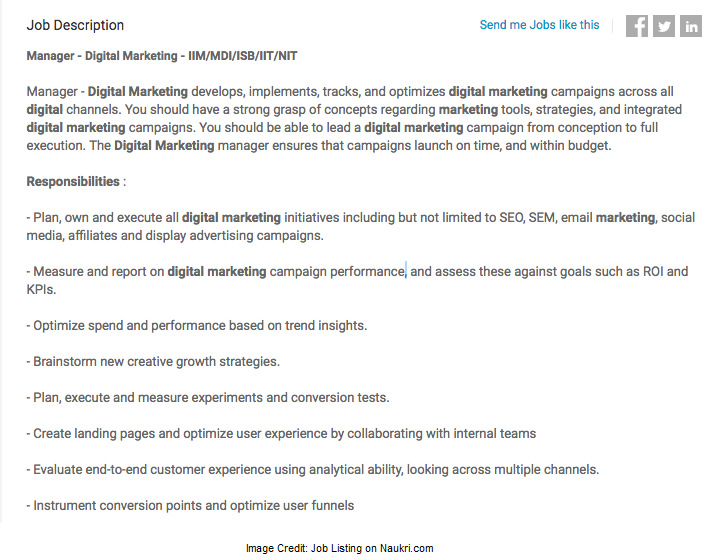 The job listing below requires digital marketing skills to be a major part of the marketing strategy. The profile is generic and requires a lot of people skills along with digital marketing. The probable questions will be more attitude based than skill based. Here the interviewer might use the STAR format. The STAR is Situation, Task, Action, Result format. STAR is a job interview technique used by interviewers to gather all the relevant information about a specific capability that the job requires. Specifically, they will ask questions about how you have handled certain work situations. Interviewers ask these questions to see if candidates have the skills and experiences required for the job. Tell me about a time you had to complete a task under a tight deadline. What will you do if a prospect is rude to you? Have you ever gone above and beyond the call of duty? What do you do when a team member refuses to complete his or her portion of the work? You can use the STAR interview method to prepare for behavioral interview questions for a role like these. If it’s your first time interview or you are a veteran, the current status of your industry does impact your job. For instance, if the software industry is retrenching candidates, and an applicant is interviewing for a post, this is naturally going to come up. Each industry or sector has different digital marketing requirements. An applicant who had successfully worked on B2B marketing on a SaaS product in the construction sector naively told an interview panel in the hospitality sector that they should not expect ambitious targets as they would be difficult to achieve because the industry was in trouble, despite the number of rising tourists! You should have the industry pain points, growth forecasts and competitor analysis at your fingertips. These will give you an edge over other candidates. Because frankly, most of them have similar profile to yours. Your research will reinforce that you’ll be able to step into the new role and perform because you know the industry and the prospects. Additionally, thorough research demonstrates that you are very keen about making a career in this new industry. Find out the best route to get to the interview location. Google maps is your best friend here. Learn the route and check the travel time. It will help you arrive at your interview right on time. Keep your phone charged if you are using phone GPS. Account for traffic which will depend on the time of the interview. If you are using public transport, learn the schedules and which service will work best for your appointment. If possible, check out your interview location. While you are there, look for the best parking spaces to avoid searching for one right before your interview. That will distract you. Plan to arrive 10 to 15 minutes early. Arriving early will give you a few moments to collect your thoughts and prepare for the interview. Interacting with other candidate is a matter of choice and depends on your personality. If you get easily nervous, avoid it. Once you are inside, smile and make eye contact. Now’s the time to rock it.